WELCOME TO MUSIKGARTEN BELLAIRE, offering quality music classes for young children in Bellaire and Houston. Musikgarten Bellaire offers classes for babies, toddlers and preschoolers, as well as two pre-piano classes for older preschoolers and kindergarteners. 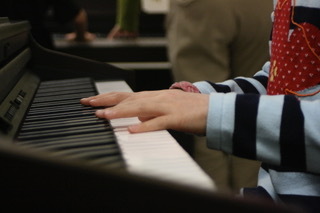 Children ages 6 and up can join our keyboard classes! Our Spring 2019 semester is underway, but it is not too late for you to visit a class! If there is space and you wish to join, tuition can be prorated. Please see our class schedule to find a class that's just right for your child. In addition, the calendar page lists important dates for you. Click here to register! I'm honored to have received the "Exemplary Musikgarten Program" award for the 5th year in a row and would love to have your family join us!! Research has shown that we are all born with an aptitude for music, but that aptitude diminishes if it is not actively nurtured between the ages of birth and nine. The Musikgarten curriculum is designed to develop your child’s music aptitude by engaging children and their families in singing and movement activities which help tune the ear, refine the voice, and develop a rhythmic body through which music can be expressed. 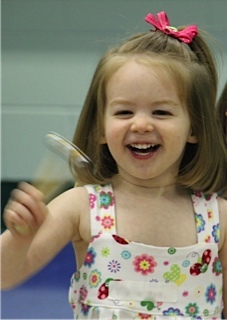 These early childhood music classes create an environment that nurtures the whole child and promotes musical literacy in active, joyful and developmentally appropriate ways. I have chosen to teach Musikgarten because I believe it is the best early childhood music curriculum available. It is based on a keen understanding of how children learn, in both a general sense and, specifically, how they learn music. A child who begins with Musikgarten classes will be well prepared for instrumental instruction by age seven. Please let me know if I can answer any questions. I'm excited about teaching this curriculum and would be honored to play a role in your child's musical development.